Lymphangioma circumscriptum (LC) is a rare but benign condition of dilatation of the dermal lymphatic vessels visible through the epidermis due to obstructed lymphatic return. While skin manifestations are a common presentation, vulvar LC is rare and often mistaken for other pathology. The dilated superficial lymph vessels can appear as vesicles or bullae that are often otherwise asymptomatic. History and physical exam may be sufficient to make the diagnoses, while a biopsy can be useful to rule out other diseases. While reports differ for the efficacy of various therapies, surgical resection seems to have the best evidence for long-term management. Observation of an asymptomatic patient is entirely appropriate. 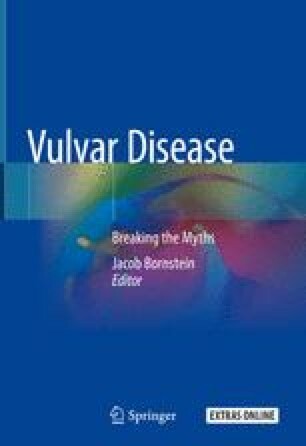 Care of the vulvar skin should be a consideration if LC lesions erode, weep, or otherwise predispose the vulvar skin to chronic change or secondary infections.